I suppose Woody Allen was due for a dud. After being distracted during the Nineties by a bitter divorce and custody battle, the four-time Oscar-winner had enjoyed quite a resurgence since the turn of the century with a string of critically-acclaimed offerings that included Small Time Crooks (2000), The Curse of the Jade Scorpion (2001), Match Point (2005), Vicky Cristina Barcelona (2008), Midnight in Paris (2011) and Blue Jasmine (2013). 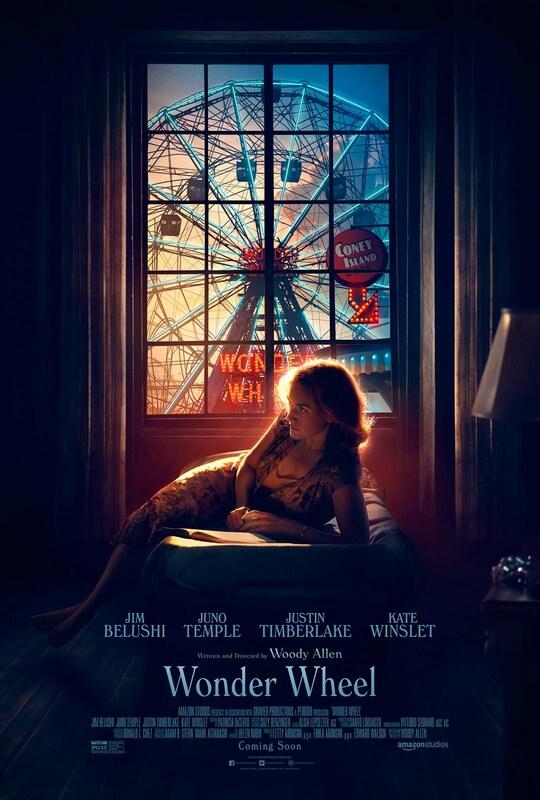 While Wonder Wheel might not be Woody's best film, it's certainly his worst of this millennium. The film is set in the Fifties on Coney Island, where the first thing you notice is that everybody's white, whether on the beaches or in the amusement park. Yes, movies made back then were often lily-white productions which gave no hint that African-Americans even existed. But it's a bit of a head-scratcher to witness a director taking his cues from a less-enlightened era, as if there's still a reason, today, to hide the fact that there were plenty of black Coney Island patrons. Besides constantly asking myself "Where the black people at?" the picture had this native New Yorker cringing at many of the characters' inauthentic Brooklyn accents. The most distracting was Jim Belushi's vaguely-familiar staccato. It took me half the movie to figure out that he was imitating the classic Chicago accent appropriately adopted by Dan Aykroyd to play opposite John Belushi in The Blues Brothers (1980). Equally-unconvincing, if not as annoying, were the manners of speaking of co-stars Justin Timberlake, Kate Winslet and Juno Temple. Bensonhurst-born Steve Schirripa was the only lead actor to have the local cadence correct. Perhaps Woody shoulda also let Steve serve as the cast's voice coach. Besides all of the above, the unengaging script left a lot to be desired. 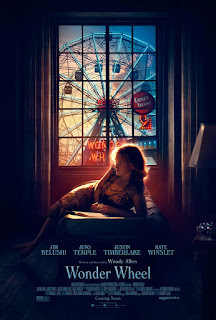 At the point of departure, we learn that a middle-aged waitress (Winslet) is cheating on her carousel operator husband (Belushi) with a young lifeguard (Timberlake). The plot thickens when her miserably-married stepdaughter (Temple) moves back home unexpectedly, and proceeds to fall head-over-heels for her hunky lover, too. This critic couldn't figure out why Timberlake was intermittently breaking the fourth wall to address the audience directly. Worse is the absence of any trademark Woody Allen humor, unless unintentionally funny moments count. Overall, a cinematic disaster that makes The Room (2003) look like Citizen Kane (1941).